This easy to knit hat is designed to fit preschool and elementary school children (aged about 4-9 years). Materials: Worsted weight yarn, used doubled. This makes a child's size medium. 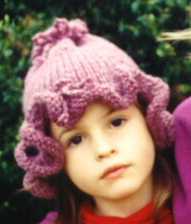 To make a larger hat, cast on more stitches (use a multiple of 4 sts) and make the hat longer. Note that two strands of yarn are used throughout the hat. Join ends of cast on row, being careful not to twist knitting. Working circularly, knit until hat is 2" long. On the next round, *K2tog, YO* repeat around. Continue knitting on 60 sts until hat is 9" long. *K1, M1* repeat around (120 sts). *K1, M1* repeat around (240 sts). Using doubled yarn, crochet a chain 20" long. (You may also twist a cord out of yarn, or use i-cord). Weave this in and out through the eyelets worked near the beginning of the hat. Pull up tight and knot securely. Tie a bow with the ends. Make another cord 14" long. On the front of the hat, just above the ruffle, pull both ends of this cord through from the inside. Tie in a bow. Weave in any loose ends. M1 - Make one - create a new stitch by making a half hitch over the right needle with the working yarn.